Traffic will flow inland from Seaview Ave. beginning Wednesday. 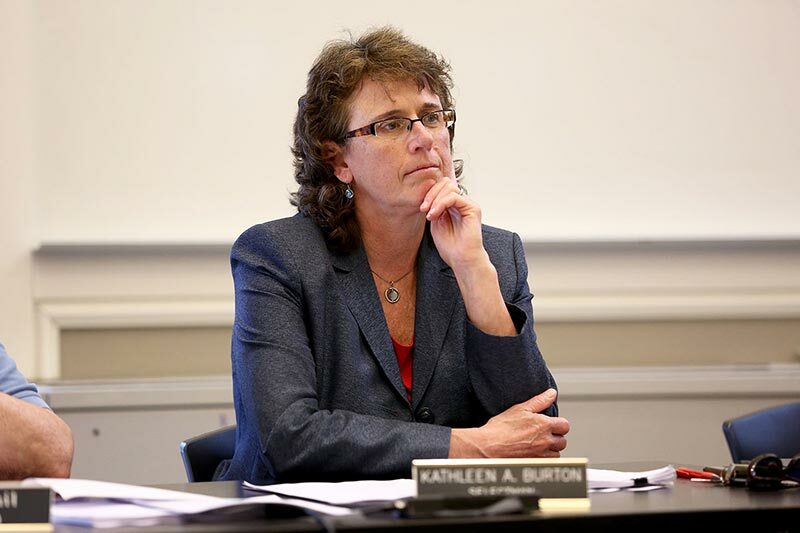 Departing Oak Bluffs chairman of the selectmen Kathy Burton. Oak Bluffs selectmen set an endurance record that will likely stand for some time, after their regularly scheduled meeting on Tuesday went for nearly five hours. 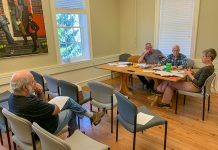 After interviewing the final candidates for the Council on Aging administrator position, the board conducted two public hearings, and, after almost postponing a repeatedly postponed vote, finally decided to make Canonicus Avenue a one-way street on a trial basis. Michael Santoro, who was recently voted board chairman and is also chairman of the roads and byways committee, was not at the meeting due to travel delays, prompting discussion to delay the Canonicus vote once again. Discussions and hearings for the change go back two years, and the final vote was delayed by a blizzard in early February, and again in March to allow for more neighborhood outreach. Due to Mr. Santoro’s absence, Selectmen Kathy Burton and Walter Vail considered delaying the vote once again, but Selectman Greg Coogan strongly opposed further delay. Almost on cue, Police Chief Erik Blake notified the selectmen that he’d just received a text from Mr. Santoro asking the selectmen to go ahead with the vote. Local residents have described Canonicus Avenue as a tragedy waiting to happen, because cars and trucks often use the road as a shortcut to or around downtown, and often travel at high speeds around two blind curves. Ms. Burton said she’s been on the fence about the change since the debate began. “Originally I felt the way Walter does, that curve is really dangerous,” she said. 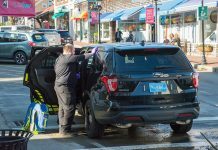 “We also don’t know how this is going to affect Nantucket [Avenue]. Selectmen approved the temporary change 2 -1. Ms. Barmakian recused herself because she owns property on Canonicus Avenue. Highway Department Supervisor Richard Combra said the change will go into effect Wednesday, May 20. Continuing a public hearing from their last meeting, selectmen weighed the fate of LoFT, the bar and adult game room on the second floor of the Martha’s Vineyard Chowder Co. that was cited with nine infractions on a spot check made by Oak Bluffs Police Detective James Morse in late March, shortly after the grand opening. Most of the infractions were due to permitting issues. In his report, Detective Morse cited LoFt for not having a change-of-use permit. Before its current incarnation as an adult game room with full bar and food service, LoFt had been a concert venue for three years. Other permitting infractions in Detective Morse’s report included incomplete entertainment-license application, failure to post occupancy load, failure to post fire-inspection certificate, failure to post OUI warning signs, failure to apply for new occupancy permit, and six counts of unlicensed pool tables. Many of the permitting infractions were addressed before Tuesday night’s hearing, Detective Morse told selectmen. There were two infractions for alcohol served to impaired patrons. Detective Morse also noted that the manager eventually asked both patrons to leave. Mr. Vail said he was inclined to shut down LoFT for one week, but that given the time of year, a warning was the most appropriate course of action. Selectmen agreed, with a 4-0 vote, to give LoFT a warning, and to allow the establishment to stay open. The warning will also be filed with the Alcoholic Beverages Control Commission (ABCC).